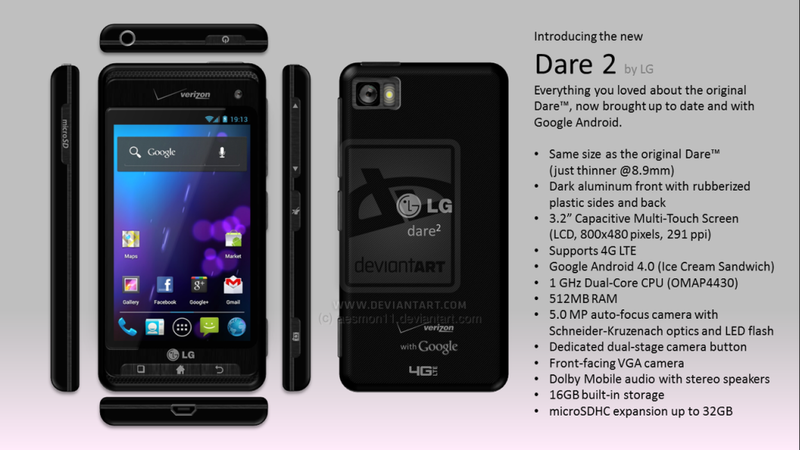 Deviantart user aesmon11 envisioned the follow-up to the popular phone LG Dare and called the concept LG Dare 2. 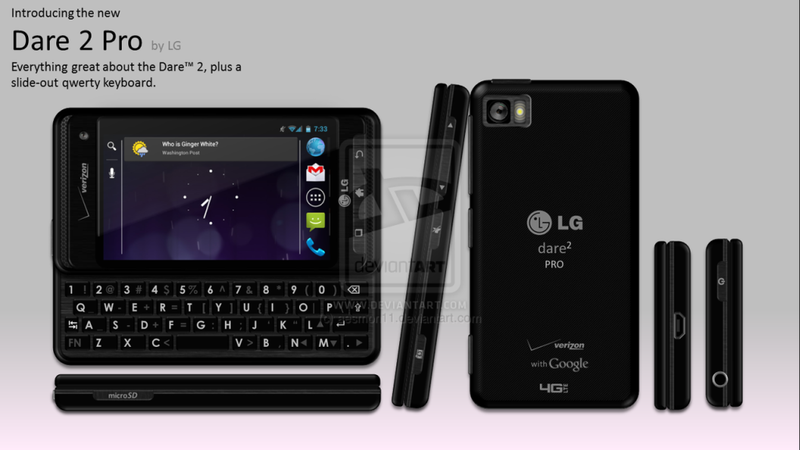 He also created the LG Dare 2 Pro concept, that has the same specs, but adds in the mix a sliding QWERTY keyboard. We’re dealing here with a midrange device with a 3.2 inch display and Android 4.0. The LG Dare 2 has the same size as the original Dare, but it’s thinner, at 8.9mm in waistline. It’s got a dark aluminum front, rubberized plastic sides and uses an LCD display with 800 x 480 pixel resolution. The new Dare supports 4G LTE connectivity and relies on a 1 GHz dual core OMAP4430 CPU for processing needs. There’s also 512MB of RAM on board and a 5 megapixel camera with autofocus at the back. Said camera uses Schneider-Kreuznach optics and LED flash. There’s also a dedicated dual stage camera button in here and a front facing VGA camera. On the media side we’ve got Dolby Mobile audio and stereo speakers and finally as far as storage goes, 16GB are available, plus microSD. The designer is saying that he could get rid of the Android buttons at the bottom, in order to expand the screen, a thing I’d like to see. The keyboard version below is pretty hot, especially since you don’t see phones like these in real life nowadays… Which one do you prefer? Samsung Galaxy Note II is a Quad Core Beast With 1080p AMOLED Display T-Mobile G1 Gets 2012 Redesign; HTC Dream Becomes a Beautiful Nightmare!